The conclusion of Peter Jackson’s second J.R.R. Tolkien trilogy is easily the best of the three. The Hobbit: The Battle of the Five Armies benefits from a tighter running time than its predecessors (144 minutes) and, for the first time in the Hobbit series, a satisfying ending. Five Armies really isn’t much more than an extended epic battle sequence, but it’s an exciting one. Martin Freeman, as Bilbo Baggins, continues to ground the saga with real emotion. 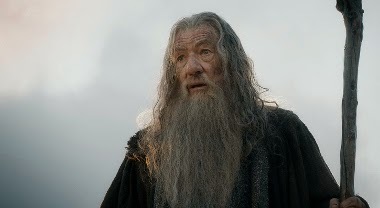 Ian McKellen’s Gandalf doesn’t have much to do, but fans of Jackson’s Tolkien adaptations will certainly feel a palpable rush in seeing the wizened wizard one final time. Picking up where The Desolation of Smaug ended, the fearsome dragon (again voiced by Benedict Cumberbatch) wreaks havoc on Laketown. Don’t expect much Smaug action. Instead, think of his brief assault as an encore for those (including myself) who felt his limited screen time in the previous film as a series highpoint. Once the dwarves’ leader Thorin (Richard Armitage) lays claim to Smaug’s vast riches, he’s overcome by “dragon sickness.” In other words, the greed that accompanies hoarding mountains of gold gets the better of him. While he lords over the other dwarves, Bilbo hides the Arkenstone that Thorin so desperately desires. Bilbo’s also got the One Ring, of course, which he strategically deploys at a key moment during the climactic battle. 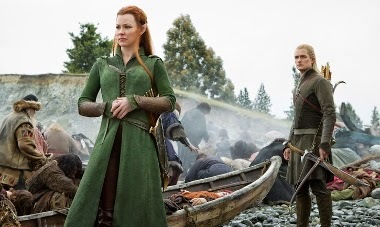 Said battle is a visually thrilling blowout between Elves, Dwarves, Goblins, and Orcs that is anchored by an effective love story between Tauriel (Evangeline Lilly) and Kili (Aidan Turner). That’s what really works here – the culmination of the various relationships that have slowly built over the course of three films. The action dominates and, as in the previous two installments, it sometimes feels like watching someone play the biggest budget video game ever produced. As Jackson has demonstrated over the course of the Hobbit trilogy, the original Tolkien text doesn’t really benefit from the multi-epic film approach. No reason to pick apart all the various ways in which the films needlessly bloat the source material (though it’s worth mentioning that Legolas’ physics-defying heroics in Battle are a particularly unnecessary addition, existing simply to bring Orlando Bloom back from The Lord of the Rings). For better or worse, this was the approach Jackson decided upon and it’s hard to hold it against Warner Bros. when they stand to gross a billion per movie. Make no mistake, it’s not art. But it’s hard not to be entertained.